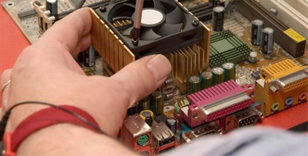 Detailed information and reviews of North Carolina companies, shops and technicians offering computer repair, pc & laptop fix and maintenance services. Post your requirements and receive no obligation price estimates and quotes. Repair - My laptop screen in broken and it has spider cracked. Cracked screen - Screen is cracked on Dell Inspiron 1545 Windows 7 need fixed as soon as possible. Computer Maintenance - Service repair and Maintenance of HP 4300/4101/4050. Replace screen and battery charger - Screen replacement for HP Pavilion dv6000 and charger replacement. Toshiba laptop repair - Screen doesn't want to turn on, 3 missing files and fingerprint scan doesn't work. Computer Repair - My computer - Windows Vista 2007, HP Pavilion Slimline, is not reading my disk and will not download. Laptop Repair - Laptop will not charge battery or stay on using the ac adapter - need the dc jack checked for repair. Dell Inspirion screen cracked - I need a new screen for my Inspirion 1501. How much would it cost to get a new one?